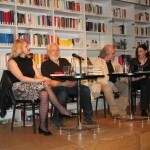 On May 23rd at 7 pm a literary evening with the popular Slovenian authors Mojca Kumerdej and Evald Flisar took place at Literaturhaus München, Bibliothek, Salvatorplatz 1, Munich. 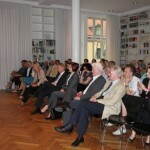 The evening was hosted by the consulate General of the Republic of Slovenia in cooperation with the lectorate for Slovenian at the LMU and SO-Übersetzen. The authors read from their works together with their translators Peter Scherber and Ann Catrin Apstein-Müller and talked with the interested listeners about their way of writing. This was be followed by a small reception. The event was attended by about 60 listeners.